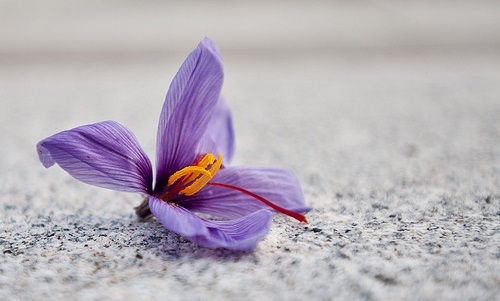 Saffron is a splendid spice which gives color and flavor to its dishes. It thrives abundantly on the fertile ground of Sardinia , making the island a national leader in its production. Sardinia is one of the few Italian regions where the “red gold” can be found, particularly in San Gavino Monreale (Province of Sassari), where the well-known international fair is held annually. The source of this valuable product is a purple flower called “Crocus Sativus” (saffron crocus) of the Liliaceae family. The pistils are harvested only by hand for 10 to 15 days between late October and early December. Harvesting is done early in the morning when the flowers are still closed. For each harvested flower, the three stigmas are extracted, which are then roasted and ground. The technique of moistening the stigma with the extra virgin olive oil before drying requires special attention and experienced hands as it is part of a tradition handed down from generation to generation. The keeping of this Sardinian tradition and special care during the development process are the reasons saffron has become distinguished by its delicate and persistent flavor, deep pigments, therapeutic effects, and aroma. Take a look at this link: the photographer Alessandro Cani has captured the private moments of this century-old tradition.